In his closing monologue on Monday night, Cuomo delivered a criticism of all violence from those on both sides of the political spectrum but argued that the violence perpetrated by anti-fascist activists was at least morally superior to the “violence of hate” by the far-right. “People who show up to fight against bigots are not to be judged the same as the bigots, even if they do resort to the same kinds of petty violence,” Cuomo argued. The CNN host’s comments came one day after the rally in Washington, DC attracted approximately two dozen white nationalists, a fraction of last year’s turnout in Charlottesville, Virginia. The 2017 rally resulted in several clashes between white nationalists and anti-fascist activists. Later in the day, one woman was killed and 19 people injured when a 20-year-old white nationalist plowed his car into a crowd of counter-protesters. 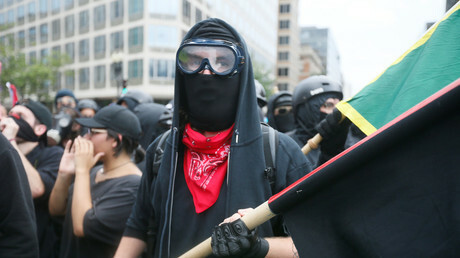 Cuomo described this year’s counter protest as generally peaceful, with masked members of Antifa “peppered in the crowd.” Some launched fireworks and bottles at police and attacked journalists. Others screamed abuse at the police. Several journalists reported being attacked by Antifa. NBC News’ Cal Perry was called a “snitch a** news b*tch” by one protester, who attempted to smack Perry’s camera out of his hand. Cuomo, whose brother is the Democrat governor of New York, framed the comments in the context of criticizing President Donald Trump for not calling out the “violence of hate” in the aftermath of last year’s rally. By doing so, the CNN host argued, Trump helped “elevate” the far-right. Cuomo’s monologue has been mocked by some on Twitter as hypocrisy and moral relativism. “An #Antifa bat to the head feels just like any other bat to the head,” one commenter pointed out. An #Antifa bat to the head feels just like any other bat to the head. You are trying to give them an #AltLeft "escape hatch" with this moral equivalency BS. So are you saying you are part of ANTIFA? How dare you even say they are an “anti hate” group. Did u see them attacking police officers & even journalist? They also threatened the POTUS & You Chris Cuomo support them? Wow that speaks Volumes about you. Secret Service is involved.